Hanover Engineering provided consulting engineering services to the firm of Derck and Edson, LLC, of Lititz, Pennsylvania, in preparation of Stormwater Management and Soil Erosion Control Plans, including constructed wetlands for water quality and stormwater management improvements on property adjacent to the Easton Area High School, in Northampton County. These earthmoving, stormwater management, and constructed wetlands projects were undertaken as part of the development of athletic fields and supporting parking lot areas. 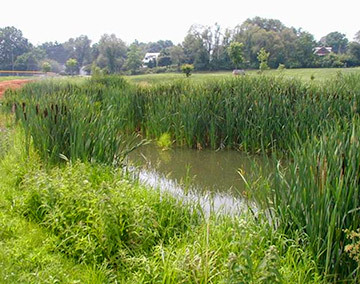 The constructed wetlands were built into a stormwater wet retention basin designed with two sediment forebays. The site was underlain by carbonate geology and the soils in this area were subject to sinkhole formation. Therefore, the entire constructed wetland system was designed and constructed with a geotextile lining to minimize risk of sinkhole creation under the basin and wetland areas, as well as to ensure adequate hydrology within the system to optimize treatment of runoff. This constructed wetland and associated wet retention basin for stormwater management provides water quality improvements for runoff leaving this site, and provides an ideal location for “demonstration and education” for students of the Easton Area School District. The constructed wetland also improves the aesthetic value within the recreation area and provides wildlife habitat benefits within a relatively urbanized area.